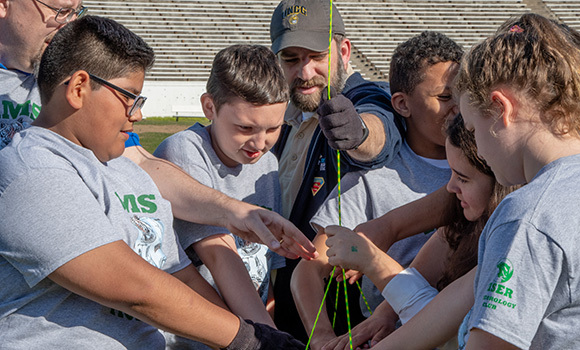 UNCG's Matt Fisher helps Kiser Middle School students release their high-altitude weather balloon and spacecraft. Andrea Barbour, SELF Design Studio graduate assistant, helps steady the weather balloon. Kiser students and UNCG collaborators watch as the weather balloon and spacecraft ascend. They reached an altitude of 87,000 feet. To learn more about the experiment, view a video below that shows the students’ preparation, the launch and views from the spacecraft. To see how UNCG brings hands-on learning to schools across Guilford County, visit the UNCG School of Education and SELF Design Studio Makerspace.